As you can see, this site is located in a trailer rather than a fixed building. 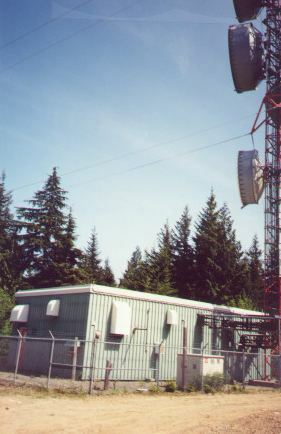 This radio site is located west of the town of Duncan on the east side of Vancouver Island, high atop one of the island's mountains. It can be heard as far away as Agassiz near Hope. Antenna height above sea level is 753 - 760m or 2470 - 2493 feet. This site was once owned by TELUS (formally BC Tel) and was sold to the government, it is now used as a Doppler Weather Radar Site. TPARC was able to sustain it's existence here after the takeover. Due to the poor road conditions and heavy snow that can occur during the winter months, this site is not accessible all year long. Our Duncan site has its backbone (trunk) antennas aimed south at Victoria and east across the water to Vancouver. The tower is a guyed mast. Many of the microwave dish antennas have been removed to make room for the Doppler radar array. Although bad weather occurs here during the winter months, it is not a big concern. Mt. Sicker receives it's AC power from the local power grid but has a back-up generator. All TPARC equipment is connected to the back-up system and will remain running during an emergency when normal power has been interrupted. 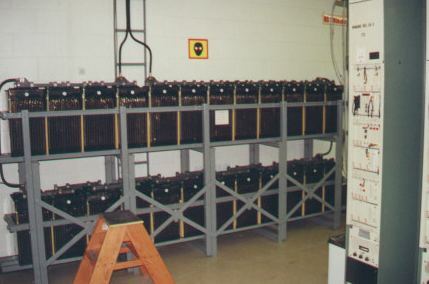 The photo above shows the large battery back-up used while the generator is starting up. This allows for continuous use of our radio equipment until the generator is fully on line. Once again you will note the 19 inch rack design used through all our sites. 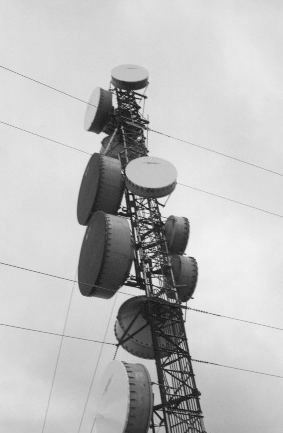 At the top are the UHF duplexers. Below is the Bell-202 modem used for signal regeneration. Below that are the Level Control Boards. The UHF Drop repeater with it's Tiny2 TNC (modem) is next with the two Harris UHF Trunk radios and their TNCs. Below the Trunk radios is the main fuse distribution panel with two 40 amp power supplies on the bottom. 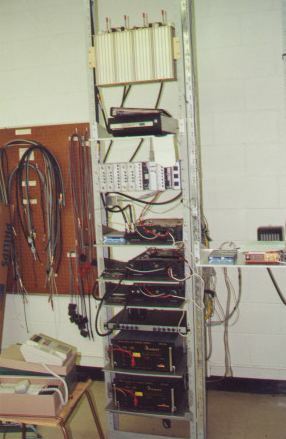 On the rack to the right is the VHF simplex repeater. Here a Western Radio WR-155 has been modified and mated to a Tiny 2 TNC. This is a very busy repeater since the TPARC server operates through this site.